Make your conservatory more secure by having our team of professionals install one way security film. Allowing you to see out but stopping potential thiefs from seeing in. 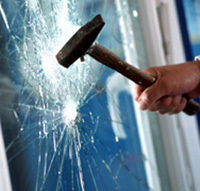 Security window films prevent glass from fragmenting when subjected to a large force such as a flying object or an explosion. Security films are coated with thicker and stronger pressure-sensitive adhesive to provide superior elasticity to retain glass shards. Conservatory Window Film, UK. © Copyright Solaire Window Films 2003 - 2019.